Personification, the anthropomorphic representation of any non-human thing, is a ubiquitous feature of ancient Greek literature and art. Natural phenomena (earth, sky, rivers), places (cities, countries), divisions of time (seasons, months, a lifetime), states of the body (health, sleep, death), emotions (love, envy, fear), and political concepts (victory, democracy, war) all appear in human, usually female, form. Some have only fleeting incarnations, others become widely-recognised figures, and others again became so firmly established as deities in the imagination of the community that they received elements of cult associated with the Olympian gods. Though often seen as a feature of the Hellenistic period, personifications can be found in literature, art and cult from the Archaic period onwards; with the development of the art of allegory in the Hellenistic period, they came to acquire more 'intellectual' overtones; the use of allegory as an interpretative tool then enabled personifications to survive the advent of Christianity, to remain familiar figures in the art and literature of Late Antiquity and beyond. 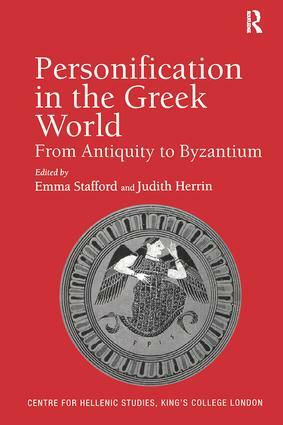 The twenty-one papers presented here cover personification in Greek literature, art and religion from its pre-Homeric origins to the Byzantine period. Classical Athens features prominently, but other areas of both mainland Greece and the Greek East are well represented. Issues which come under discussion include: problems of identification and definition; the question of gender; the status of personifications in relation to the gods; the significance of personification as a literary device; the uses and meanings of personification in different visual media; personification as a means of articulating place, time and worldly power. The papers reflect the enormous range of contexts in which personification occurs, indicating the ubiquity of the phenomenon in the ancient Greek world. Contents: Editors' introduction. Part I Origins and Varying Modes of Personification: Hesiod in context: abstractions and divinities in an Aegean-Eastern koiné, Walter Burkert; Disaster revisited: Ate and the Litai in Homer's Iliad, Naoko Yamagata; Brightness personified: light and divine image in ancient Greece, Eva Parisinou; The gender of Death, Diana Burton; The Greek heroes as a 'personification' of the past in the present, Kerasia Stratiki; Neo-platonic personification, Lucas Siorvanes. Part II Personification in Myth and Cult: Side: the personification of the pomegranate, Efthymios G. Lazongas; Personified abstractions in Laconia: suggestions on the origins of Phobos, Nicolas Richer; Situational aesthetics: the deification of Kairos, son of Hermes, Arlene Allan; Eros at the Panathenaea: personification of what?, Irina Kovaleva. Part III The Poet and his Work: The muses: creativity personified?, Penelope Murray; A lover of his art: the art-form as wife and mistress in Greek poetic imagery, Alan H. Sommerstein; Personification of the Iliad and Odyssey in Hellenistic and Roman art, Kristen Seaman. Part IV Looking at Personifications: Eunomia or 'make love not war'? : Meidian personifications reconsidered, Barbara E. Borg; From drunkenness to a hangover: maenads as personifications, Amy C. Smith; Personifications and paideia in Late Antique mosaics from the Greek East, Ruth Leader-Newby; Rivers of Roman Antioch, Janet Huskinson. Part V Images of Power, Time and Place: Poleos Erastes: the Greek city as the beloved, Yorgis Yatromanolakis; Personification in impersonal context: late Roman bureaucracy and the illustrated Notitia dignitatum, Iskra Gencheva-Mikami; Good luck and good fortune to the queen of cities: empresses and Tyches in Byzantium, Liz James; The labours of the twelve months in 12th-century Byzantium, Elizabeth Jeffreys. Consolidated bibliography; Indexes. Dr Emma Stafford is Lecturer the School of Classics at the University of Leeds, UK. Judith Herrin is Professor at the Centre for Hellenic Studies, King's College London, UK.